How did it come to THIS? (Part two). Part one is connected to the e-mail expose which WIS has yet to post- a work in progress. Under the circumstances regarding the spitter and Mosser Paul Huebner a police report was filled that night by the victim of the spitting Aron Hershkop. [Paul “the goy” Huebner is one of the orchestrates of the Shomrim Six Mesira and is currently the attorney and front-runner for the $144 million dollar lawsuit against the Shomrim Six]. Two days later, on Tuesday, July 27th, the victim A.H. went to retrieve his complaint number and was advised that no report was filed. The police report had mysteriously disappeared. WIS was informed that there is a 40 minute audio recording of the report being made. 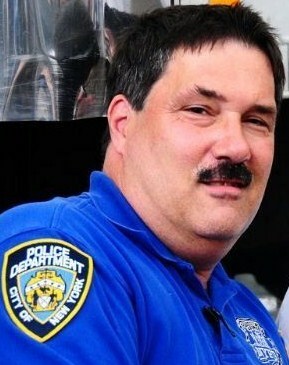 Every report that is made must first pass through the Inspector of the precinct, in the 71st precinct that would be Inspector Peter Simonetti . After the Inspector sees the report, he will then decide what to do with it. The Inspector can give the case over to a detective to investigate or if the report is against someone like Paul Huebner, a Shmira member and an ID holder of the C.O.P. [aka. KAPO] program created and managed by known other than Peter Simonetti. Or, Simonetti is afraid the report will bring crime stats up. No inspector wants his stats up. IAB (Internal Affairs Bureau) was contacted and as a result an investigation in to the matter ensued. In an act of revenge Inspector Peter Simonetti has decided to target the complaining victim (whose report went missing) and his volunteer organization the Shomrim safety patrol. 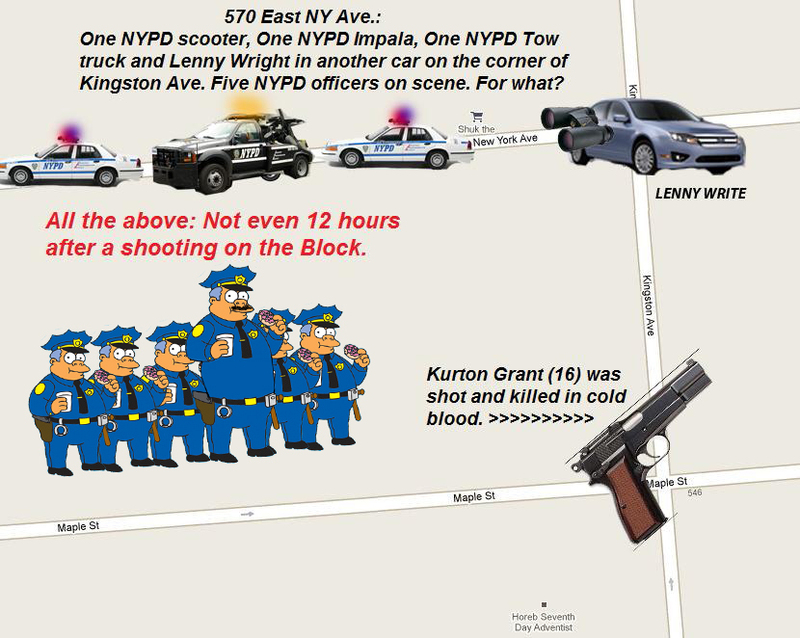 One example: On the same day (about 12 hours earlier) Kurton Grant (16) was shot and killed in cold blood on Kingston Ave. and Maple, the police department, led by NYPD gangster Lenny Wright, Simonetti’s right hand man, shows up on East New York Ave, just around the corner of the murder scene. So we have here a police department who spends its day staking and targeting an innocent civilian. This entire episode take place on three day holiday stretch, when Jews spend most of their day in the synagogue, in order to cowardly tow a car. The police spend over two hours removing the car, yet, around the same corner it’s an all-out gun war. The law is that if a vehicle is illegally parked on the side walk, the police must first issue it a ticket/summons before towing. No ticket/summons was issues in this case. No civilian complaints were made regarding cars on sidewalks. The car was not blocking the side walk. The inspector ordered the officers to specifically go down that day (Rosh Hashona) to get A.H. car on East New York avenue. Lenny Wright, Simonetti’s right hand man, was sitting in an unmarked car down the block (Kingston and E.N.) supervising and staking out “like a thief in the night” the two hour operation . Shomrim has been parking their command post for Simchas Bais Hashoava on Crown and Kingston for the last 5 years. For the past three years, Shomrim has been parking on Crown and Kingston for every Shabbos and Yom-Tov. There is absolutely nothing happening on that corner (Crown and Kingston) that would warrant the police having to move it. 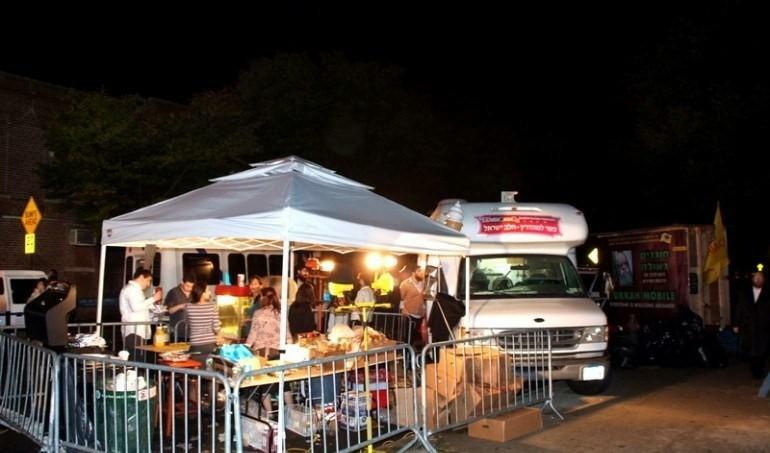 As a matter of fact, all the corners are occupied by various vendors selling cotton candy, ice-cream, soda and hot-dog. The only reason to remove a command center that actually helps the community (with missing children, safety etc…), is pure hate! The strength and hate Simonetti and his gang have all come from individuals in OUR community who consider themselves “askonim”. Individuals like Yingi Bestristky, Chanina Sperlin, Shmira Mesira suckers, and there are reports Zaki Tamir was at the scene too, not only did these “askonim” not object, they arranged it, they encouraged the towing of the Command Post. NOTE: The Shmira Mesira suckers are understood they have no boundaries when it comes to Mesira (Here, Here, Here, Here, Here, and Here) 311 is on speed dial by them. What amazes WIS is, who help the Nazi vs. the Jews, who help the communist Russians vs. the Jews, in-fact in all of history it was Jews “askonim” like these who advanced the agenda of the Jewish enemy. The Command post and scooters were removed illegally. Both the command and scooter were broken into by police officers. It was found that a Shomrim radio went missing (stolen property). Mother America or Mother Russia? Abuse of Power, Corruption and Cover Up! This entry was posted on September 27, 2010 at 3:43 am and is filed under Exposed. You can follow any responses to this entry through the RSS 2.0 feed. You can leave a response, or trackback from your own site. why do you say your going to post something and then have us wait three days before you actually do post, whats the deal with that? Got to have the people wanting more. It makes things ever more exciting. If all these facts are true (which from past events I do believe that they are) how in the heavens name are these “thugs”(Simonetti, Wright) still supposedly “protecting” our community??? Yingi Bestristky we are taking over your position. We want more members to join the force. we want them to be young. we want all the private cars painted red and white. we want you out!!! sound good to you??? LEAVE SHOMRIM ALONE!!! The problem with Shomrim is that they are to good, they are to nice. All these years they just stood by on defense, never going on the offense. The only way to defeat any enemy is bring the fight to them. They ponce at you, you block and ponce back twice as hard. This is the only way to finally end this, this is the only language they will understand. I appreciate all the great things shomrim does and they should never stop. BUT if you want peace, you will have to go on the offense and kick some Tuches. Sadly this is the only way!!! (it works). Since the dawn of the atomic age, we’ve sought to reduce the risk of war by maintaining a strong deterrent and by seeking genuine arms control. Making sure any adversary who thinks about attacking the United States or our allies or our vital interests concludes that the risks to him outweigh any potential gains. Once he understands that, he won’t attack. We maintain the peace through our strength. Weakness only invites aggression. This strategy of deterrence has not changed. It still works. Murder rising at alarming rate, sending waves of fear throughout NYC’s most dangerous neighborhoods. The number of people shot citywide has gone up 4.5% from a year ago, jumping to 1,374. The number of people wounded or killed by gunfire is up citywide, sending waves of fear through some of New York’s most dangerous neighborhoods. NYPD statistics through the first nine months of the year show the number of murders has climbed 13.2% from the same period last year. There were 341 murders at this point last year compared with 386 through Sunday, according to the most recent data available. Cops in the 75th Precinct in East New York, Brooklyn, have investigated 23 homicides this year – the most in the city. Bullets have been flying over the Bronx, too. There’s been an 18.3% spike in the borough. In the 47th Precinct, which sits in the northern section of the Bronx, the number of murders is up 46.2%: Nineteen people have been killed in that precinct this year, up from 13 during the first three-quarters of 2009. The murder rate is up 25.9% in Queens, 12.2% in Manhattan and 7.4% in Brooklyn – the borough which sports some of the city’s most crime-plagued neighborhoods. Eighteen people have been murdered in Brooklyn’s 67th Precinct, unnerving longtime East Flatbush residents. The number of people shot citywide has gone up 4.5% from a year ago, jumping from 1,315 to 1,374. The uptick in murders comes after a year in which the city recorded 466 – the fewest number of slayings since the NYPD began keeping track in 1963. Though the overall crime rate is down 1.5% citywide, primarily due to a 6.2% drop in grand larceny, most felony categories are up. Rapes have increased 13.5% citywide, including a disturbing 45.1% jump in Manhattan. There have been seven rapes in Central Park this year. During the first nine months of last year, no one reported being raped in Central Park. New York, NY – The Village Voice says its investigation of the New York Police Department’s Internal Affairs Bureau has revealed a pattern of “dirty little secrets, witch hunts and just plain incompetence.” The paper says officers describe the secretive police-department-within-a-department as troubled, and it uses three cases to illustrate. For one, all IAB complaints are supposed to be confidential. That rule is necessary because police officers who complain about their colleagues can and do face retaliation. But the reality seems to be that an officer’s home command will find out fairly quickly that an Internal Affairs complaint has been made. Several officers say that shortly after they filed complaints with Internal Affairs, their home commands knew about it and then pursued various types of retaliation against them. Second, whether big or small, IAB cases seem to plod through the system at the same snail’s pace. There doesn’t seem to be any mechanism to deal quickly with a minor case—an office dispute, for example. Thus, cases drag on, and aggrieved, frustrated cops turn to the courts to resolve their issues. That, in turn, costs the city more money in legal bills and settlements. Third, it’s impossible—even for the people who file the complaints—to find out what was done and what happened with a complaint. Internal Affairs investigators often don’t return complainants’ phone calls.